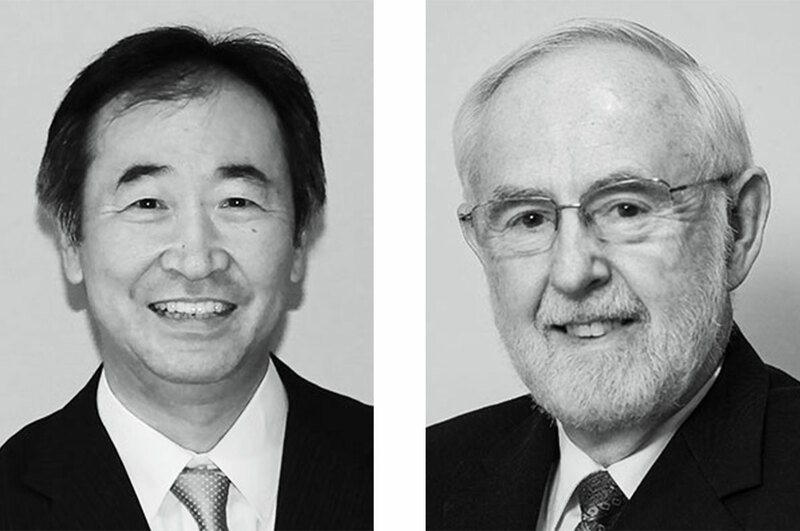 Takaaki Kajita and Arthur B. McDonald received the call from Sweden for their work on the Super-Kamiokande and SNO experiments. The 2015 Nobel Prize in Physics was awarded this morning to two physicists whose teams discovered a fundamental property of neutrinos. The work of Takaaki Kajita and Arthur B. McDonald showed that the tiny particles, which come in three types, change from one type to another. The discovery has had major implications, and today scientists wonder whether neutrinos are the reason that matter exists in our universe. Neutrinos are the most numerous matter particles in the universe. They come from a variety of sources, such as cosmic rays, the sun, exploding stars, the center of the Earth, nuclear power plants and even nuclear processes within your body. They are neutral and rarely interact with other matter; thousands of trillions of neutrinos pass through you each second. Physicists speculated that the problem lay in their calculations or in the experiment. But Kajita’s and McDonald’s experiments showed that the solar neutrino problem was caused by the extraordinary nature of neutrinos. Kajita led a team on the Super-Kamiokande experiment near Tokyo, which started operation in 1996. McDonald led a team at Sudbury Neutrino Observatory in Ontario, which began in 1999. Both experiments used large detectors located underground to catch passing neutrinos. Super-Kamiokande studied muon neutrinos produced by cosmic rays interacting with Earth’s atmosphere. SNO studied electron neutrinos produced by the sun. Because neutrinos can travel straight through the planet, Super-Kamiokande studied the particles as they approached from above in space and also below through the ground. The neutrinos should have arrived from all directions at the same rate; the only difference between them was the distance they had to travel before they reached the detector. But scientists found that they detected more muon neutrinos coming from above than from below. They hypothesized that the neutrinos traveling all the way through the Earth had had more time to oscillate, or change to another type of neutrino. At SNO, scientists used a detector that could identify electron neutrinos from the sun but also take an overall tally of neutrino interactions from all three types of neutrinos. They saw the solar neutrino problem repeated; they were capturing just a third of the electron neutrinos they expected to see. But their count of all three types of neutrinos together matched their expectations. They concluded that electron neutrinos must have changed into muon and tau neutrinos as they traveled. Super-Kamiokande and SNO solved the solar neutrino problem. But they also gave scientists another surprising insight into the particles: Because only particles with mass can oscillate, neutrinos must have mass. The mass of neutrinos is much smaller than the mass of other fundamental particles in the Standard Model of particle physics. Scientists have yet to be able to measure it directly. And they still aren’t sure where neutrino mass comes from—perhaps the Higgs boson, or perhaps another source. Many questions remain about neutrinos. Today’s Nobel recognizes two scientists whose research answered some of them—and raised a few more. Kajita was born in 1959 in Higashimatsuyama, Japan. He earned his PhD in 1986 from University of Tokyo, Japan. He is currently director of the Institute for Cosmic Ray Research and a professor at University of Tokyo in Kashiwa, Japan. McDonald was born in 1943 in Sydney, Canada. He earned his PhD in 1969 from California Institute of Technology in Pasadena, California. He is a professor emeritus at Queen’s University in Kingston, Canada.